RESERVE your LUXURY 2 bedroom apartment Today! These contemporary 2 bedrooms won't last. Apply NOW! Nominated for BBJ 2018 Best In Real Estate Award 'Best In Show'! Located within walking distance to the area's hottest entertainment, cafes and restaurants, you'll find endless things to do! 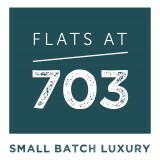 The Flats at 703 offers a perfectly measured mix of boutique apartments right in the heart of Towson, Maryland. Experience an exclusive lifestyle just minutes from Baltimore and with easy access to D.C.
With just 105 apartments available in studio, one- and two-bedroom spaces, each unit is a modern sanctuary with a sense of high quality distilled into its interiors’ warm, reclaimed materials and textures. Get a glimpse of the premier living experience available - check out our photo gallery. This attention to small batch luxury is evident in every element of the community, which features a rooftop lounge, coffee bar and easy walkability to Towson’s popular shops and restaurants. Much like a limited series of whiskey, these flats are going fast! Contact us today and one of our staff members will get in touch with you soon!